What will your bank account look like in 6 months? Easily understand how the decisions you make today affect your bank account tomorrow (or in a few months). 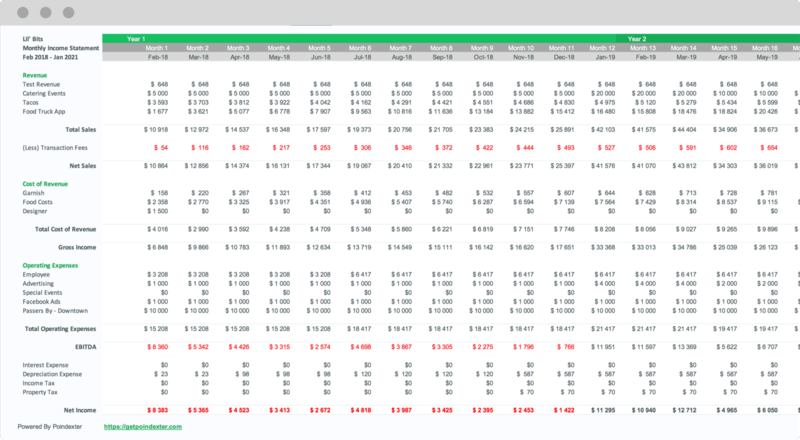 Plan your activities, and Poindexter generates a financial model worth thousands of dollars in minutes. Automatically produce all of the financial information you need to make decisions that help you manage cash flow intelligently. 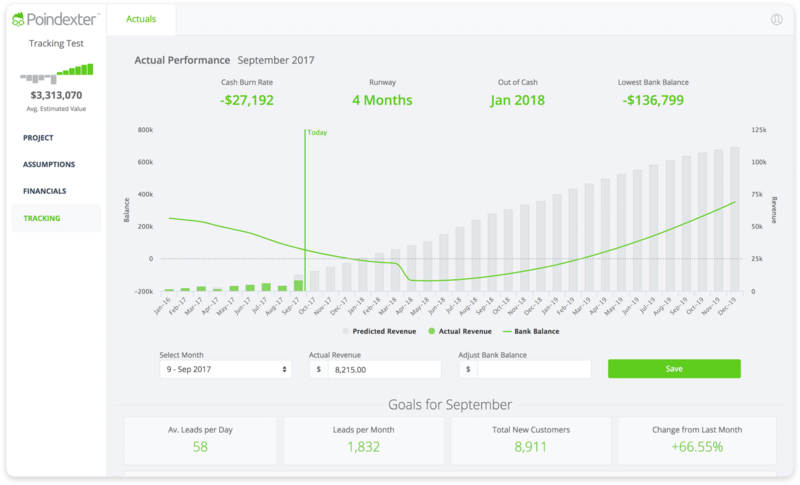 Your customer dashboard updates each month with acquisition goals that convert your forecasts into daily tasks, which keeps you focused on the activities driving revenue. Proactively address potential cash shortages by tracking your performance and staying on top of how real-world events affect your plans for growth. Privately share your progress with key people, or invite collaborators to manage their own department, so expectations are always up to date. Quickly create detailed conversion funnels for sales and marketing channels to understand the ROI of customer acquisition activities. Prepare yourself for any situation by quickly understanding how to respond in worst and best case scenarios. Track your revenue and bank account balance to manage cash as your plans come face-to-face with reality. Answer sophisticated financial questions with ease. Plan debt, equity or asset based scenarios in seconds to figure out how you'll grow. Invite collaborators to help build your plan, and generate a custom password protected link to share with other stakeholders. Automatically produce the standard financial documents you’ll need to get a loan or to raise money from investors. Stay on track with an up-to-date dashboard that by breaks your monthly customer acquisition goals down into daily tasks. Turn your financial projections into impressive presentations by exporting all financial data to Excel. Select the forecast horizon that fits your project needs, from simple 3 year forecasts to longer 10 year initiatives. Copyright © 2016 Poindexter, Inc.